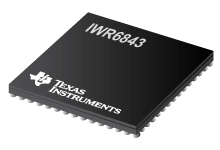 The IWR6843 is an integrated single chip mmWave sensor based on FMCW radar technology capable of operation in the 60-GHz to 64-GHz band. It is built with TI’s low power 45-nm RFCMOS process and enables unprecedented levels of integration in an extremely small form factor. The IWR6843 is an ideal solution for low power, self-monitored, ultra-accurate radar systems in the industrial space.